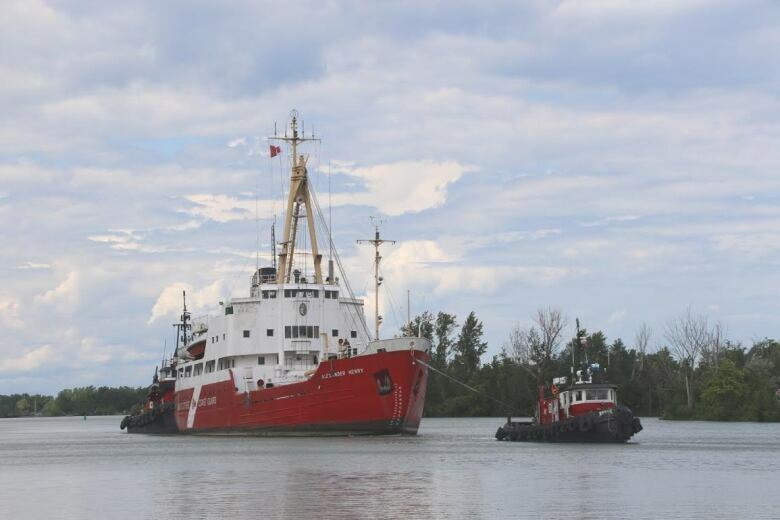 Alexander Henry completes its journey from Kingston to Thunder Bay, Ont. 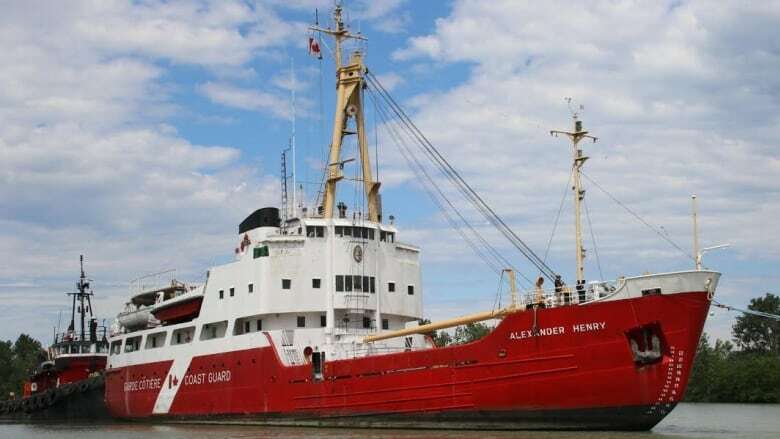 The Alexander Henry, the former coast guard icebreaker built in the Thunder Bay area almost 60 years ago, has completed its journey back to the Lakehead, but it will be a little while longer before people can see it up close. An agreement still has to be finalized for the ship to dock at the former Pool 6 site along the waterfront, Charlie Brown, the head of the Lakehead Transportation Museum Society, told CBC News on Tuesday just after the breaker arrived. In the meantime, the Alexander Henry will sit at a privately-owned dock nearby "which unfortunately the public is not going to be able to access," he said. "We wanted to have a big celebration while she was coming in, but that wasn't possible," Brown continued. "Hopefully we'll be able to get her where she needs to be, hopefully at the Pool 6 site." The Alexander Henry was built by the Port Arthur Shipbuilding Company and was commissioned in 1959. 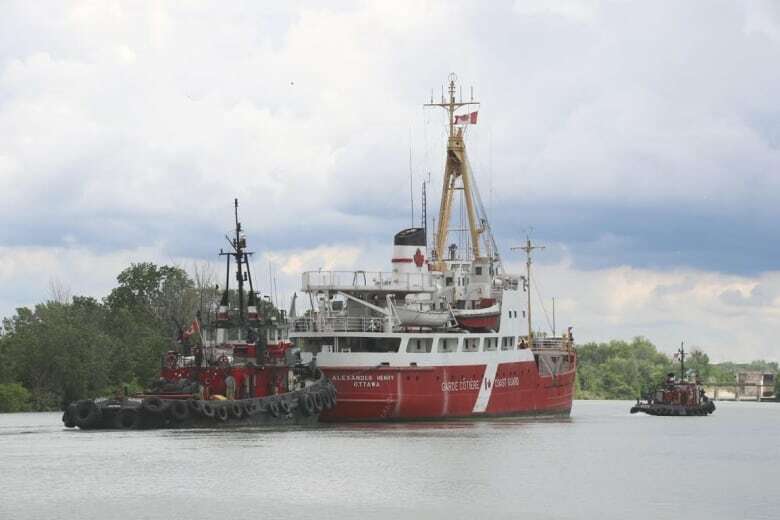 It worked the Great Lakes until the mid-1980s, when the Samuel Risley, came into service. Before Brown and his group took ownership of the breaker, it was almost intentionally sunk to the bottom of Lake Ontario as a dive tourism spot. Thunder Bay city council recently signed off on $125,000 to have the Alexander Henry towed north; now, they'll have to okay a deal with the port authority to use the Pool 6 site, Brown said. Council isn't scheduled to meet again until later in July, meaning the Alexander Henry's public unveiling probably won't happen until mid-August, assuming a deal is reached, Brown added. "[It'll] give us the opportunity to work on her over the next month and then hopefully the issues wil be resolved," he said. "We'll get her where she needs to be and then we'll open 'er up to the public and have a big grand affair and a big party and we'll take it from there." Brown said there are some security concerns with the Kam River Heritage Park site and the museum society would rather not use it. As for the Alexander Henry itself, Brown said it is in generally very good condition but still needs final inspections and a tidying up before people can board it. "We're just thrilled to have seen her come through the breakwall," Brown said, adding that he wants to open the ship to the public as soon as possible so it can start generating revenue.